A beautifully designed custom staircase is not complete without an accompanying handrail system. In fact, it is often the handrail design that truly catches the eye and takes the stair system to a new level. This week, we explore three popular types of stair railings – wrought iron, stainless steel, and cable rail. We discuss some highlights of each style and share inspiration photos. As you consider stair railing designs for your next project, consider these three striking options. Undeniably popular, wrought iron stair railings offer limitless design options and are suitable for both straight and curves stairs and balconies. Our ornamental metal products are hand-forged in our facility by talented craftsmen, and powder coating provides a far more durable finish than less expensive painted products. One of the top benefits of wrought iron is its versatility. From clean, modern styles to elaborate Tuscan scrolls, wrought iron can be forged to meet your space’s needs. 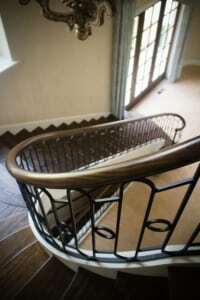 Below, we feature a beautiful curved stair with a wooden rail and wrought iron balusters. The unique combination lends sophistication and warmth – a beautiful fit for this luxury home. View our wrought iron railing gallery for additional ornamental metal inspiration photos and project details. Another popular stair railing option, stainless steel lends a sophistication and modern flair to a residential or commercial space. With contemporary clean lines and lasting durability, these railing systems are also highly versatile. Our innovative design team can bring your vision to life. 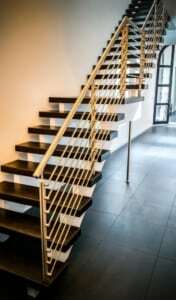 Our featured stainless steel railing below is the perfect complement to its freestanding, open-riser “floating” stair. The clean lines of the steel rail mirror the stair’s unique shape and add to the contemporary flair. The bright silver contrasts beautifully with the dark wood treads and white stringers. Visit our stainless steel gallery to view additional photos from our unique projects. Next, we explore another popular stair railing design option: cable rail. Also boasting clean lines and a sleek, modern look, cable rail can easily enhance any stair or balcony. Cable railing’s strength and durability creates a perfect fit for projects of all types, including interior and exterior staircases. The project below illustrates cable rail’s ability to enhance homes and commercial spaces of all styles. Paired with wooden rail and newel posts, this cable rail system lends a contemporary flair to a craftsman home. 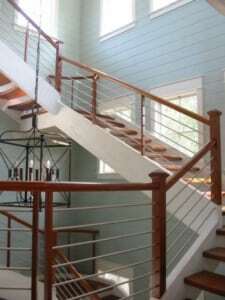 Check out additional photos and details in our cable railing gallery. 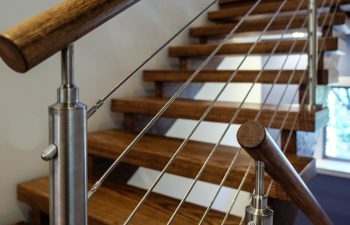 Whether you select wrought iron, stainless steel, cable rail, or another design element for your custom staircase, our team provides top quality and a seamless experience for each customer. Through our turnkey approach, each handrail system is constructed and pre-fit to the stair within our state-of-the-art facility. The system is then delivered and installed at the job site. This process eliminates last minute adjustments on site, preventing messy work and project delays. Learn more about our approach to partnering with homebuilders, general contractors, and architects. From inspiration to installation our team is committed to designing and building the highest quality custom staircases. Contact us to discuss your next custom staircase project.